The company behind the development of ground-breaking technology for the evaluation of epithelial-based cancers, creators of a web-based clinical data collection and reporting platform, and inventors of a fluid management solution for use in surgery and intensive care were among the winners at this year’s Medilink UK Healthcare Business Awards . The 2013 competition honoured the best UK life science and healthcare technology businesses and the winners were announced during last week’s NHS Healthcare Innovation Expo in London. In total there were five winners, with awards handed out for Best Start-up, Best Innovation, Best Partnership with the NHS, Best Export Achievement, and Outstanding Achievement . Hosted by celebrated international broadcast journalist, Edie Lush, guests recognised the achievements of the award winners and networked with some of the leading professionals from the life Sciences sector, UK government, research institutes and overseas organisations. 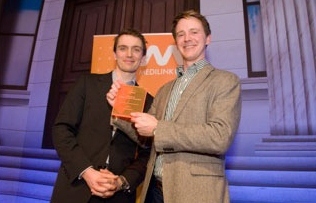 The nominees for the awards were derived from regional awards, which were selected by Medilink’s network across the UK. Winner of the Start-up Award was East Yorkshire-based Savantini for its research, design and retailing of products to help men and women improve pelvic floor problems, bladder weakness and other health-related issues. Edinburgh-based DySIS Medical won this year’s Innovation Award for its development of ground-breaking technology for the evaluation of epithelial-based cancers using dynamic spectral imaging. The Export Achievement Award was presented to Llanelli-based Chromogenex Technologies. The company secured the award for its outstanding record in selling its range of laser and light-based products for the medical and cosmetic market to more than 50 countries worldwide. The Partnership with the NHS Award was awarded to Truro-based myClinicalOutcomes. The web-based clinical data collection and reporting platform, developed by clinicians, allows patients with orthopaedic conditions to monitor their progress remotely and long-term using clinically-validated assessments. Deltex Medical, based in Chichester, won this year’s coveted Medilink UK Outstanding Achievement Award for its CardioQ-ODM Oesophageal Doppler Monitor, a device that provides a solution to fluid management in surgery and intensive care. Recommended by NICE in 2011 for use in more than 800,000 NHS operations, it was cited within the DH’s Innovation, Health and Wealth as one of the six high-impact innovations to be adopted by the NHS in 2013/14.